For the LIRR Evergreen Branch station, see Ridgewood station (LIRR Evergreen Branch). For the LIRR Lower Montauk station, see Ridgewood station (LIRR Lower Montauk). Ridgewood station in October 2014 from the Hoboken-bound platform. Drinker, W.W.; Howard, Frank A.
Ridgewood is a major New Jersey Transit rail station hub. 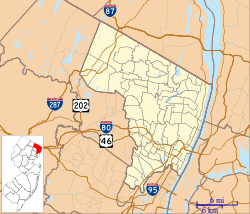 It is located in downtown Ridgewood, Bergen County, New Jersey, United States. It is served by the NJT Main Line as well as the Bergen County Line. For riders on the Main Line or Bergen County Line going to a station that is not served by their line, Ridgewood is one of two transfer options presented at the time of ticket purchase (Secaucus Junction is the other) and is widely used for that purpose. The Erie Railroad built Ridgewood station in 1916 as a grade-separated elevated station. It has been listed in the New Jersey Register of Historic Places and National Register of Historic Places since 1984 and is part of the Operating Passenger Railroad Stations Thematic Resource. Ridgewood station underwent a major renovation project in which high-level platforms were installed. This allows for easier boarding, as customers are now able to walk directly onto the train from the platform instead of having to climb into the train cars using their steps, as well as making Ridgewood station handicap accessible. As part of the reconstruction, the side platform along Track 1 was demolished to make way for an island platform that would also serve Track 3 and replace that track's side platform, which was fenced off. Wheelchair ramps were installed on both high level platforms and elevators were also built to carry passengers from the platforms to the floor of the underpass on Franklin Avenue. Ridgewood station is now one of seven stations along the Main and Bergen County lines that are handicap-accessible, joining the Route 17 and Main Street stations in Ramsey, Boro Hall station in Glen Rock, Paterson station, Rutherford station, and the reconstructed Plauderville station in Garfield. The station features three platforms. Two platforms are mostly high-level, while one low-level platform is no longer in use. Track 2 is for all trains heading to Hoboken Terminal and intermediate points on the Main and Bergen lines and is located adjacent to a portion of Godwin Avenue known as Garber Square. Track 1, the middle of the three tracks, is for Bergen County Line trains headed for points north, as well as express trains to Port Jervis and freighters, and Track 3 is for Main Line trains headed towards Waldwick, Suffern and Port Jervis and is adjacent to South Broad Street between East Ridgewood Avenue and Franklin Avenue. Many Bergen County Line trains also use Track 3. Underpasses beneath the tracks and beneath a bridge on Franklin Avenue connect the two platforms. Citizens Semi-Centennial Association (1916). Ridgewood, Bergen County, New Jersey, Past and Present. Ridgewood, New Jersey: Citizens Semi-Centennial Association. ^ "List of Station Names and Numbers". Jersey City, New Jersey: Erie Railroad. May 1, 1916. Retrieved November 23, 2010. ^ "Main and Bergen County Line Timetables" (PDF). Newark, New Jersey: New Jersey Transit Rail Operations. November 7, 2010. Retrieved November 27, 2010. ^ a b Van Valen 1900, p. 242. ^ Citizens Semi-Centennial Association 1916, p. 113. ^ Citizens Semi-Centennial Association 1916, p. 114. ^ a b "NJ Transit Begins to Improve Ridgewood Station" (Press release). New Jersey Transit. February 24, 2009. Retrieved February 14, 2010. ^ Moving the Needle: 2011 NJ Transit Annual Report (PDF) (Report). New Jersey Transit. p. 12. Retrieved February 17, 2019. 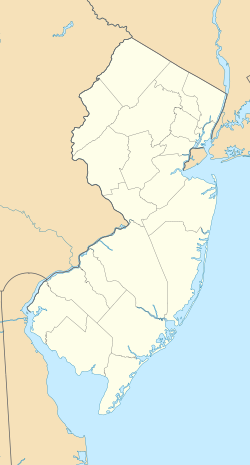 ^ a b "New Jersey and National Registers of Historic Places". New Jersey Department of Environmental Protection - Historic Preservation Office. Retrieved 7 January 2015. This page was last edited on 9 April 2019, at 20:05 (UTC).